AP Assistant professor notification 2018 recruitment university wise : The AP universities has released Assistant Professor Recruitment 2018. Aspirants seeking for AP Govt Jobs can utilise this excellent opportunity to fill Assistant Professor Posts. Candidates can start registration for AP Assistant Professor Vacancies through online at http://www.sche.ap.gov.in/asstprof/Masters/HOME.aspx. 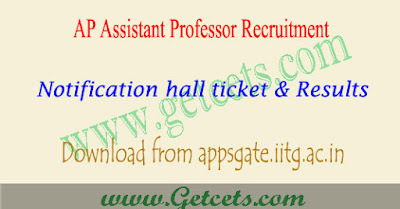 Applicants have to check all the relevant details of AP Assistant professor recruitment 2018 like eligibility criteria, education qualification, age limit, online application forms, exam date, screening test details, hall ticket download, selection process, etc., that are clearly mentioned in AP Assistant Professor Notification 2018. Authorities will accept applications through online mode on www.sche.ap.gov.in/asstprof. Eligibility to apply for the Post : The applicants must ensure that he/she fulfils the eligibility conditions for the post. Before applying for a post, candidates are advised to satisfy themselves about their eligibility. Please refer the University Notification, eligibility criteria, Qualifications, Roster Points and other details. The applications received for the posts of Assistant Professor shall be scrutinized for recommending the applicants to be called for interview and the eligibility for the posts of Assistant Professor shall be in accordance with the UGC Regulations, 2010 as amended from time to time. Merely fulfilling the minimum qualifications or the eligibility criteria does not entitle an applicant to be necessarily considered or called for interview. Applications which do not meet the eligibility criteria given in the advertisement and / or are incomplete in any respect shall be summarily rejected at any stage of recruitment. In case of any dispute/ambiguity that may occur in the process of selection, the decision of the University shall be final. Separate Application Fee for each Post : Applicants applying for more than one post/department/university must apply separately and pay fees separately. Application fee for each post : For OC & BC Categories – Rs.1,000/- + Taxes applicable For SC, ST & PH CATEGORIES: Rs.500/- + Taxes applicable. The Candidate’s application is successful only after making the payment. After successful payment, confirmation page will be displayed. If the confirmation page is not displayed, submission of the application is deemed to be not successful. • Fee once paid shall not be refunded. Therefore, the Candidate is informed to apply for the post subject to his/her eligibility. Hardcopy of the application : A hard copy of the online application along with self-attested required documents must reach the Registrar of the concerned University on or before the last date to the address given in the notification (preferably by Registered/Speed Post/In Person). Application received after due date shall not be considered and will summarily be rejected. The University shall not be responsible for postal delay, if any. The name of the post & department & online application registration number must be mentioned on the top of the envelope. • All communication shall be sent to the registered e-mail/provided correspondence address. One screening test for all universities : The Candidates shall have to appear only one Screening Test in a particular subject for any number of Universities he/she has applied. For example, if a Candidate has applied for the Assistant Professor post in Management Department in Acharya Nagarjuna University, Andhra University, Sri Venkateswara University etc., he/she has to appear only one Screening Test conducted in Management subject. However, if the same Candidate is also eligible to apply for Assistant Professor post in ‘EDUCATION’ subject and applied for both ‘Management’ subject and ‘Education subject’, such Candidates have to appear screening test for both the ‘Management’ subject and ‘Education’ subject to be conducted on different days. Hence, the Candidates are advised to apply for any number of posts in any number of Universities through single user id on the website. Scheme of the Screening Test : The test will consist of two papers. Paper I, common to all Candidates, will be Teaching and Research Aptitude, while Paper II will be concerned subject. Paper I and Paper II put together are for 300 marks. Paper I will contain 120 objective type questions for 120 marks (each question carries 1 mark). For Paper II, the Candidates have to answer 180 objective type questions for 180 marks (each question carries 1 mark). Duration for Paper I is 2 hours & Paper II duration is 3 hours.